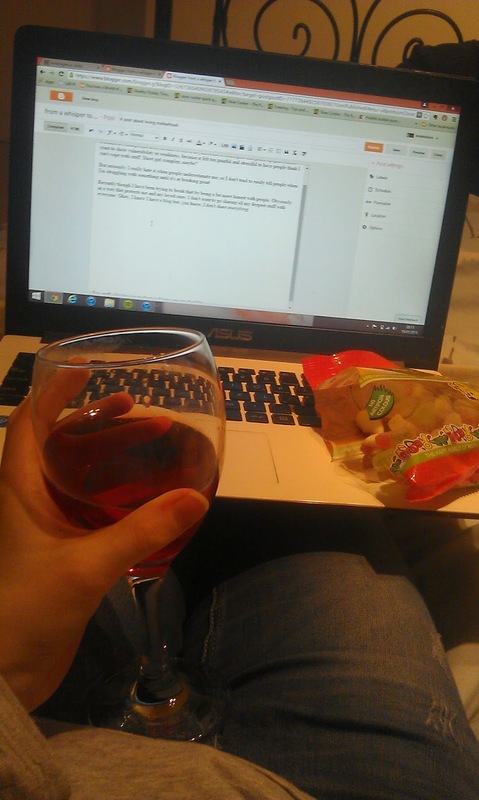 Tonight is a night of the following: writing, a glass of wine, my bed, and a bag of Haribo. Not bad, huh? I'm enjoying writing these pour-your-heart out posts right now. There are seven of them saved as drafts in Blogspot, waiting for me to give them attention. I've realised I'm incredibly lucky to be able to pour out my heart in such a way. To enjoy expressing my emotions creatively is a very good thing. Sometimes, I read an incredible piece of prose, or I listen to a beautiful song, and I think: you are so lucky to be able to do that. To convey such emotion and depth and beauty in a creative way. I'm thankful for them. I am thankful for people who take the time to perfect their art and who take the risk of baring their souls to the rest of us. They add to the beautiful noise we create on this Earth when we let go of the fear that comes with being watched and judged and criticised. I find it very, very difficult to apply the above admiration to myself. I wrote last week about fear. Fear, I've realised, is a sneaky thing. It grows in your heart and tangles itself in your veins and then it tightens its grip, and then you can't move away from it. The more you struggle, the tighter it gets. I could talk about the effects of fear on multiple areas of my life, but today, I'm focusing on the area of being creative. (That's the voice in my head. I call her Shana. She's not very nice. My apologies if your actual name is Shana, I'm sure you're lovely). The fear can grow in me so much that it not only affects my desire to allow people to see what I've written, but crosses over into my actual writing as well. It's paralysing. It stops me from even typing a sentence. Faced with a blank blog post, sometimes I stare and my mouth starts to go dry and I realise that whatever it is I might want to say probably won't sound the same when I write it down. It's all about guilt and fear, isn't it? Guilt about putting my time into this instead of actively choosing to serve other people. Guilt because I don't measure up to other (more organised) mothers. Fear of putting myself out there and being knocked down or rejected. Fear of pursuing something, only to find that I'll never get any better than this, and it will never go anywhere. Get lost, guilt: I am serving my loved ones by being creative. Let's face it: I am a creative person, which means when I am not being creative, I am grumpy and unhappy. God made me this way, no? This doesn't mean I get to prance around all day long living in a world of art and fairies and rainbows. Washing still needs to be done occasionally. But you get the gist. There's no point in trying to make myself like other women, because I am not like other women: I am me. Whether I like it or not. When I purposefully make time for writing, when I actively cultivate creativity in my life, I'm happier. I see things from a different perspective. Writing helps me to deal with difficult things in life: it helps me to absorb stuff, process it, and move on, rather than trying to bottle things up. When I am creative, I am more caring, energetic, and excited about life. Another bonus for them is that I am capturing memories for us to look back on later. Sometimes photographs don't convey everything: the way you felt, how tired you were, the hilarious back story. Those sorts of things can get lost over time if they're not preserved. That's a good enough reason to do it all by itself. Farewell, fear: Firstly - why does it matter if I never go anywhere as a writer? Why does everything in life have to be about material gain and success and one-upmanship? It's not about looking good in the eyes of men, it's about pursuing something that I love and think I am good at. If in ten years time I'm still blogging away and I haven't written anything more 'serious' than this, well, that's ten years of writing time well spent anyway. Secondly - I will get better. I'm not claiming to be a literary genius whose every word flows like a song. Writing is a craft: you put work in, you get results out. It's like making furniture, or something. You tables might start out a bit wonky with one leg shorter than the others, but they get better and more polished with time. It's the same with writing. Being so afraid of not being very good that I don't ever get around to writing is, frankly, stupid. You learn the art of writing by reading and writing. Just like you learn the art of editing by cutting out all the crap stuff. What I need to do is write now, and worry about polishing it later. Take that, guilt and fear! The new me eats stupid and pointless emotions for breakfast. So here I am, boldly saying: this is a huge part of me. My head is in writing mode pretty much constantly, and I wouldn't have it any other way. I am privileged to be able to express myself, and to be able to lay aside fear and self-condemnation. I write for my emotional health, I write to capture a moment, I write so that I can do what I have written about before: to have life, vibrant, full, and good. I don't think I said anything in response, so I'll tell you now, kid: no. It's not. I didn't write for a while when I left school. Years, actually. I kept my dreams pushed down deep in my chest because it felt like a safer place for them. That is not a legacy I want to leave behind. A life of burying stuff because I was too afraid to do anything else. If nothing else happens with this, if I write for a while and it never turns into anything or I change direction and this is the most public my creative work ever gets, I'd like my kids to get this lesson from it: pursue what you love doing, put your heart and soul into everything you do, work really hard, and don't be afraid. Which comes down to leading by doing again, doesn't it. Just to be clear, let me see if I’m describing you right: You love to read, you always have. You think words are powerful and beautiful and devastating when used correctly. You have a story, ideas, a lot to say. These things rattle around in your brain and if you don’t get them on paper, YOU JUST MIGHT DIE. Describes me in a nutshell. Really.